The date the compass was first invented is unknown. The ancient Greeks knew about the attractive properties of magnetism. The oldest known reference to lodestone’s properties appeared in 600 BC, when the Greek philosopher Thales of Miletus noted iron’s attraction to it. Thales attempted to explain the phenomenon through 'animism', presuming that the lodestone possessed a 'soul'. It is thought that the Chinese were aware that you could magnetise an iron bar by stroking it with lodestone (also spelt 'loadstone' ) as long as 2000 years ago. Lodestone appeared in China in divining boards used by fortune tellers to predict the future and in simple compasses for explorers. Lodestone is a naturally occurring magnetic rock, a magnetic oxide of iron. All varieties of magnetite display signs of magnetism, but of them, only lodestone possesses distinctly north-south polarity. That makes lodestone rare. Lodestone and other magnetic iron ores often occur in igneous and metamorphic rocks found around the world. The word 'lode' means 'way', so a lodestone is literally a 'way stone' as it shows you the way. By the tenth century, the idea of using iron magnetised in this way to determine direction had been brought to Europe, probably from China, by Arab traders. By the 12th century very simple compasses were in use in the Mediterranean and despite the fact that the magnetic compass was in general use in the Middle Ages, little was known about precisely how it worked. A compass consists of a freely suspended magnet, shaped like an arrow, positioned in a case that has north, south, east and west marked on the base. The case is held horizontally and rotated until the point of the arrow is pointing to the 'North Pole' marking on the base. A compass-arrow will point north unless a strong magnetic field is overpowering the earth's field. Therefore when using a compass you should not be anywhere near a magnet or electromagnet. Magnetic field lines or magnetic flux lines indicate the direction a compass would point when placed near a magnet. The pattern can be seen using iron filings but to find out the direction you have to use a plotting compass. The closer the lines are drawn to each other (the more densely packed the line pattern) the stronger the field. Always include an arrow on each line (N to S) or part of a line you draw. Field lines never cross (special care is needed in diagrams!). 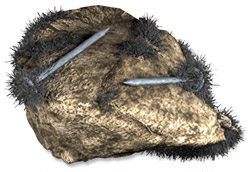 Click here for an interactive demonstration of iron filings around a magnet and here for the field lines when two or more magnets are used.